To examine the interplay of C and N availability, glucose (high microbial availability) and cellulose (low microbial availability) were added to soils collected from a temperate forest that had received simulated N deposition for 6 years (organic and/or inorganic N). The priming effect was higher for glucose addition than for cellulose. N deposition decreased the priming effect of easily available glucose but increased the priming effect of cellulose. This confirmed an interactive effect of fresh organic matter (FOM) availability and N deposition on priming. Furthermore, the interactive effect was affected by the form of N deposition, with interaction mainly observed with organic N deposition. Qualitatively different patterns of priming were observed for the two FOM types and were accompanied by contrasting abundance of fungi and bacteria in the community, as determined by phospholipid fatty acid (PLFA) analysis. Organic N deposition increased bacterial biomass but decreased the intensity of priming. In contrast, a competitive advantage of fungi with respect to organic N sources may drive priming by cellulose. 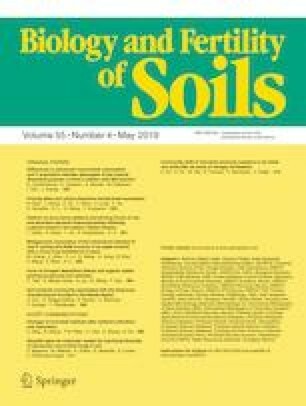 The results highlighted the importance of the availability of FOM in regulating the priming effect and showed that interactions between the form of N deposition and the availability of the FOM should be considered when predicting soil C cycling in scenarios of increased N deposition. Organic N deposition had a greater impact on priming effects than inorganic N deposition, and the influence of microbial availability of FOM largely depended on organic N deposition. The online version of this article ( https://doi.org/10.1007/s00374-019-01357-8) contains supplementary material, which is available to authorized users. This research was supported by the National Key R&D Program of China (grant no. 2016YFA0600801) and the National Natural Science Foundation of China (grant nos. 31570466 and 31830015).